Méribel is a world famous ski resort in The Rhone – Alpes, know for it’s pretty village, great shopping, restaurants and lively après scene! Méribel benefits greatly from its central position within the Trois Vallées ski area. Not only that, people visit year after year because they love the friendly atmosphere of the Village. Everybody will find something to enjoy here. 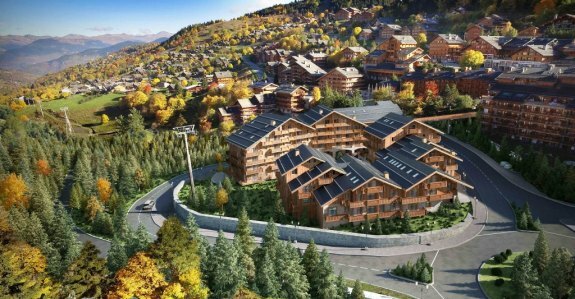 You will find luxury apartments in Méribel in wooded chalet-style buildings extending high up a west-facing slope. The uniformed architecture of the Village means that nothing looks out of place, this appeals greatly to those looking to invest in property in Méribel. Méribel and the other ski resorts of The 3 Vallées (Courchevel, La Tania & Val Thorens) combined make one of the largest linked ski areas in the world. Access to Méribel’s neighbouring resorts has improved recently due to investment in lifts. The resort caters well for the alpine shopper and of course for those that might like to add to their handbag collection with Prada, Dolce & Gabbana and Fendi, to mention a few. The Olympic Centre includes an indoor swimming pool, fitness centre, climbing wall, spa and indoor ice-rink. The combination of strong skiing, easy access and uniformed attractive architecture, makes Méribel one of the safest bets for investment in a ski apartment. We have an extensive range of new ski apartments in Meribel that are being released for sale in December 2015. Demand is expected to be extremely high due to the lack of new developments available in such a famous resort. Leonardo DiCaprio Foundation All change in Europe and France – or is it?